I’ve made this pack, or one to fulfill the same role, 6 or 8 times now. Most for my own use, a few for friends. It continually evolves. 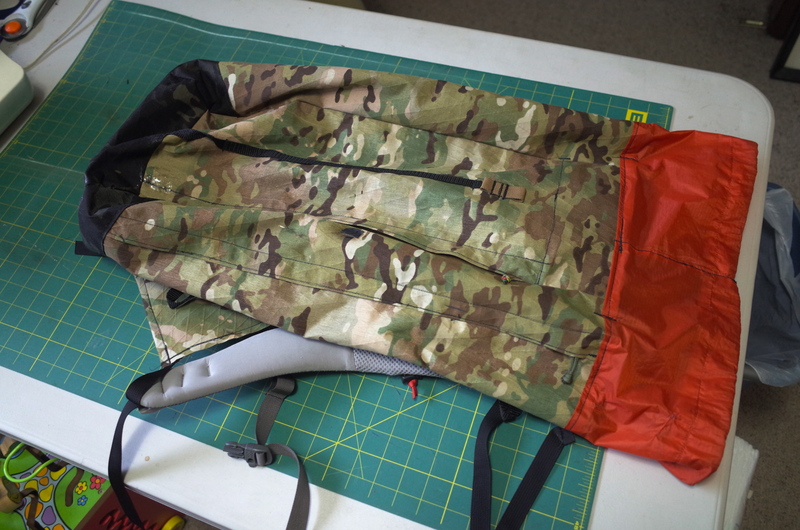 The most recent version got axed because the back panel taper got too funky and resulted in a subtle narrowing pinch point in the middle of the pack, which made packing and unpacking a pain. The top closure was also too complicated, and the hipbelt connection didn’t work properly. This version is made from scraps and pieces of this pack and this pack, plus some from another pack which never saw the light of the net. You never get as much material from a cut up project as you think, but I was careful in my cutting and deliberate in my planning, and in this case it worked with no compromises. Which is rare. Using the intact backpanel from pack one even expedited construction such that once I got sewing the whole mess took less than three hours. Which is very rare. I should note that the death knell for pack one ended up being that damn spreader bar. 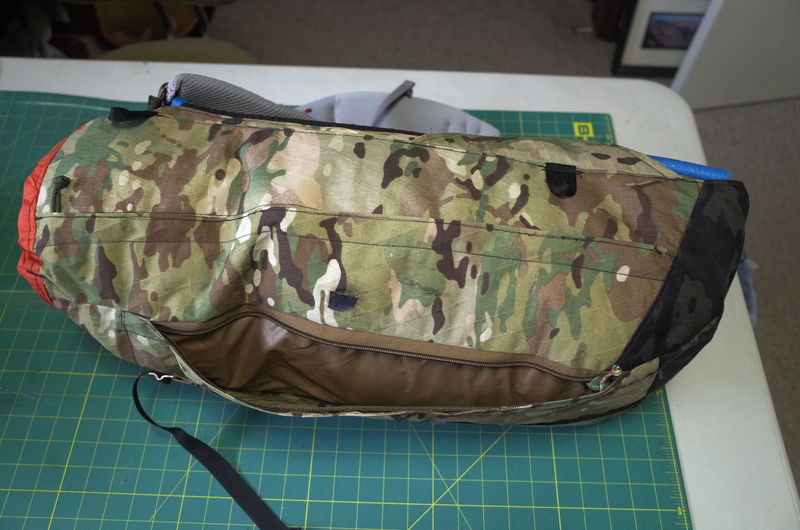 Nothing worked to my satisfaction, and an attempt to make a pack with a tapered foam panel that would facilitate similar dimensions did not work out. So that’s currently an unsolved puzzle. The tight exterior pad slot with laterally folded blue Walmart works very well, with an ideal balance of support and flexibility for 20 pounds and under, and keeping that feature was a priority. The other things I wanted in this pack was access, fast, and plenty of it. Quick and unpredictable diaper changes are a fact of life hiking with an infant, and no pack in the fleet addressed that well enough. Diameter is 31 inches at the bottom, 35 at the very top. 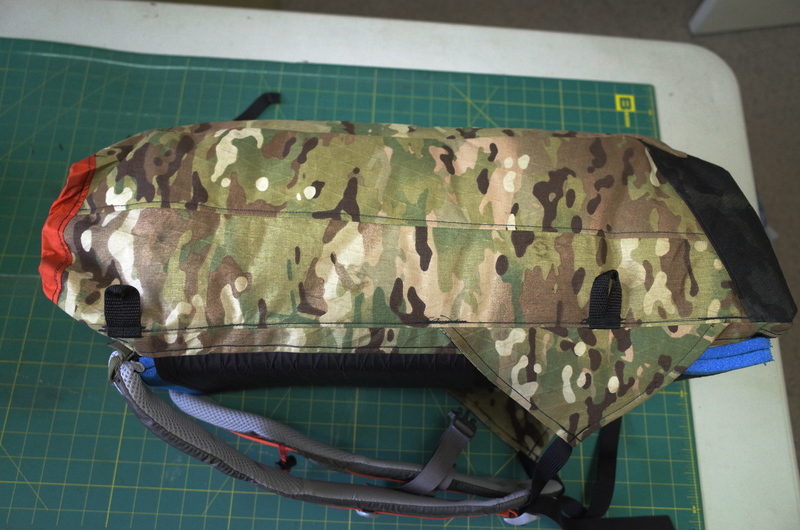 Backpanel height in 28 inches to the top of the extension collar. 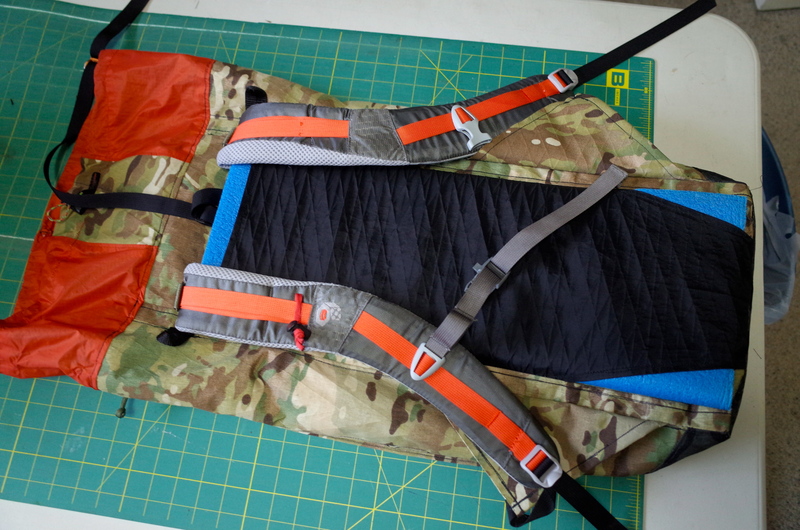 Materials are X33 and X50, with 40D sil/PU for the extension collar, 70D nylon ripstop for the inside of the rear pocket, and WX20 for the pad slot. 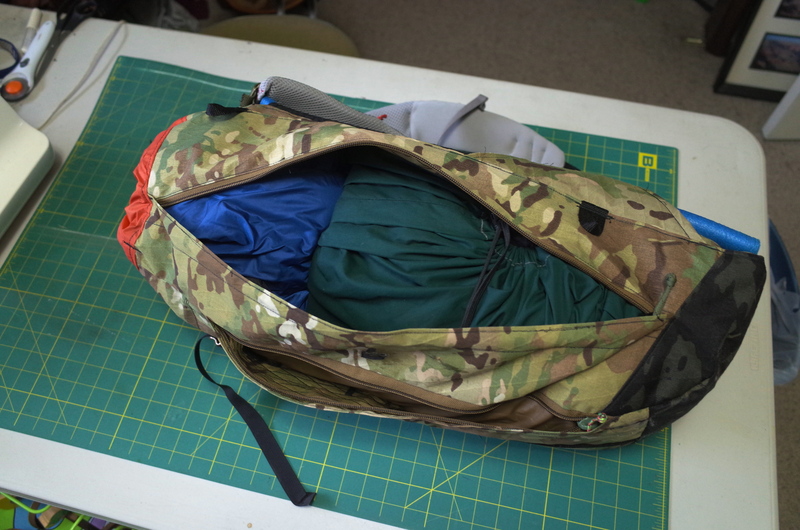 All zips are standard #8 YKKs. The bottom X50 reinforcements on the side panels will be good for longevity, keep the zipper coil from the worst abrasion, and were dictated by the X33 panels I had to work with being a tad too short once squared up and sewn together, Ideally I’d have been able to skip the seam on the non-zip side, but I can live with that. The back panel is 9.75 inches wide all the way up. Side panels are 7 inch, tapering to 8.5 above the shoulder curve. 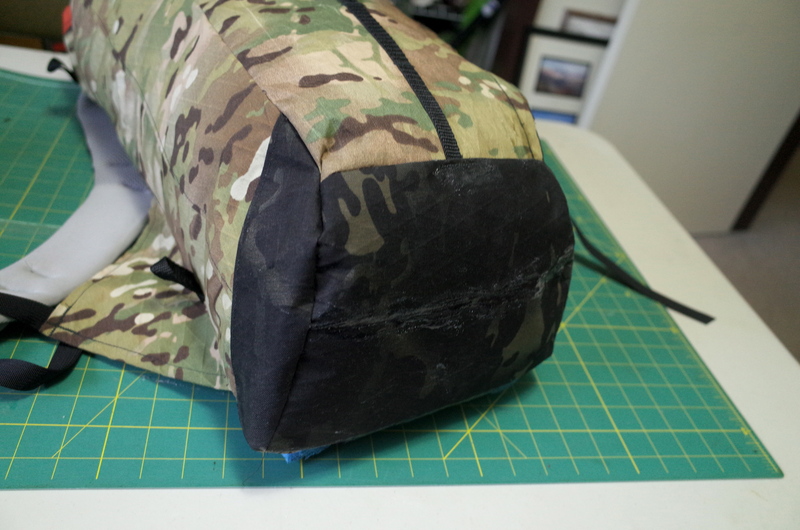 The front panel is 7 wide at the pocket bottom, with a half inch of taper up to the extension collar. 4-6 inches of gain in diameter from bottom to top seems to be the magic range for packs, with smaller ones ideally being at the smaller end, really big packs at the larger. Any less and packing is just a little less easy, any more and things seem to end up feeling ungainly. As is plain in the penultimate photo, the bottom tapers both in (1.3 inchs per side) and up (3 inches total), to keep things sleek. You loose capacity and a bit of packing ease compared to a square or rectangular base, but gain considerably in climbing ease and in style. I am not interested in packs with non-tapered bases, generally speaking. At the end of these projects there is always something you wish you did differently, almost immediately. Aside from two minor sewing flaws the only thing to make the list is moving the upper lash loops along the side panel down an inch or so. Which is not a bad list, at all. I like, what are the provisions for used diaper? What is the intent for the front pocket; used and unused diapers? Lastly, are you storing used in a Locsac? Nothing specific, just easy access. 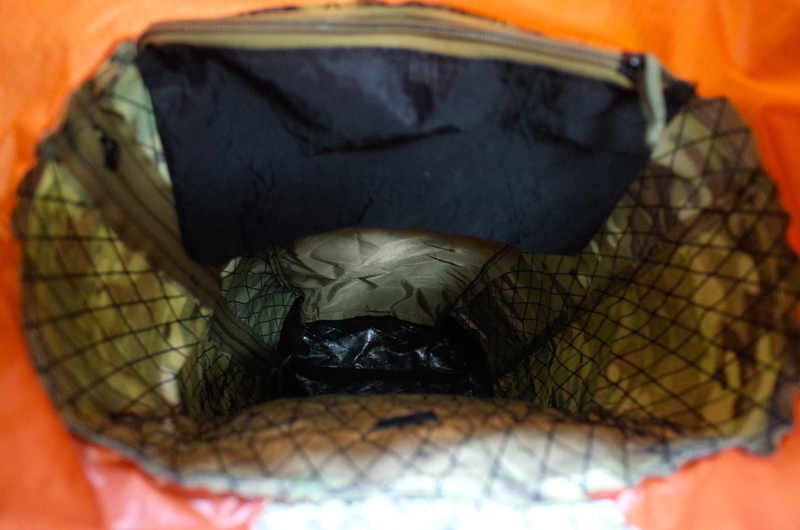 While backpacking we used a small OR drybag which worked well. The wet bags wick via the zipper which is a fail for more than half a day.